Drag bits can be either solid or welded construction. Solid, or one piece construction, is the most durable and recommended for all oilfield and natural gas applications where error cannot be tolerated. Only one bit manufacturer makes a one piece carbide drill bit - Kay Rock Bit Company! Because of the large flow course, the Kay bit is suitable either for air or fluid drilling and does not detract from the bit's strength. All tungsten carbide tips are silver soldered to the bit wing by a special process to ensure a strong bond that will not shear or break when drilling through hard rock. All Kay bits are one piece construction of alloy steel forged or cast with tungsten carbide cutting tips and gauge sides to insure long life. Drag bits come in two designs: step and chevron. Step drill bits are designed to drill soft to medium formations while chevron type bits are for harder formations. 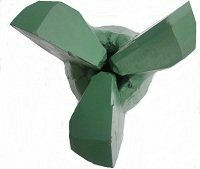 A step drill bit is used for drilling overburdens with sands, clays and soft formations. These bits will produce larger cuttings than a Chevron style bit. Because the step drill bit is more aggressive than the Chevron, ROP will be higher. However, it will be less durable as well. Rotary table speed should be between 60 and 80 rpm with light weight on bit (WOB). Chevron drill bits are used for drilling more abrasive formations like soft sandstones and shales. The Chevron style bit is more durable than the step drill bit but, because of cutting structure, will penetrate more slowly. Rotary table speed should be between 50 and 60 rpm with light to medium weight on bit (WOB). Harder formations require more WOB. 3 WING OR 4 WING? Simply put, 4 wing bits are the most durable AND have the lowest ROP. When making a decision on which bit to buy, however, don't purchase a 3 wing just to be able to drill faster. Always remember that damaged carbide cutters slow penetration rates. Additionally, 4 wing bits are more stable and tend toward drilling a straighter hole. Kelly bits are commonly used for table drive rigs. Common threads are 2 3/8 IF, Mayhew regular, Failing or Mayhew Junior. The extremely long gauges help condition the hole. DRAG BIT SIZES - 3 7/8" to 26"